One night as I was putting her to bed she told me she wanted to make her own cupcake. I asked her what kind of cupcake did she want to make. She said she wanted a vanilla cake, pink raspberry frosting, a cherry on top and a piece of white chocolate. I promised her I’d help her make them. And later, we made her cupcake together. They ended up being incredibly cute, don’t you think? 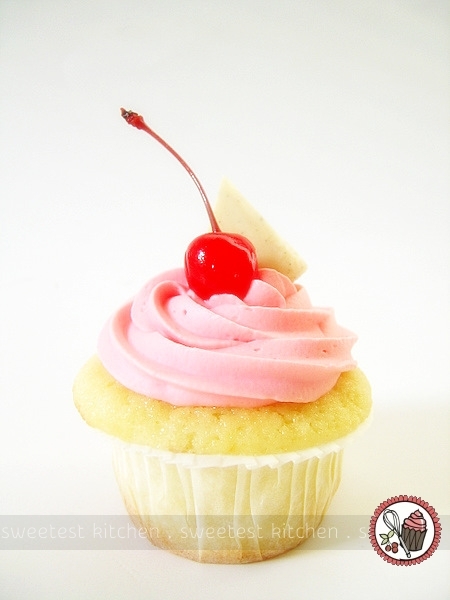 The recipe is made up of Billy’s vanilla cupcakes, a basic vanilla buttercream that has been tinted pink with red gel and flavored with LorAnn raspberry flavoring from Bake It Pretty, and topped with a maraschino cherry and a shard of Ghirardelli vanilla bean white chocolate. The cupcake liner is also from Bake It Pretty. In case you’re wondering why I didn’t use real raspberries to flavor the frosting it is because I have realized that raspberries actually turn frosting purple, and my daughter wanted pink frosting, so I had to artificially flavor and color it. It was a fun experience for my daughter to see her cupcake brought to life, and for me it was a great moment to realize how creative she is! Your daughter is brilliant! Can’t wait to try this cupcake which includes all of my favorite flavors! What a cute cupcake! You have a future blogger/foodie on your hands :). aw, so sweet! i love that she thought this up on her own and told you about it. how are you/things as you settle into the new continent? No way! I just posted about the same flavor combo! But I had to browse for a recipe and did not dream about it- which is way cooler. Gorgeous cupcake! Glad you mentioned CH…. is there an ingredient for Jan? I missed out on December’s roundup but really want to get back to it for Jan. Thanks! Oh, the Easy Bake Oven is a great idea! I only hosted December’s Cupcake Hero challenge, which I had a lot of fun with. Cupcake Hero is now back in CB of I Heart Cuppycakes‘ hands, but as far as I know, no ingredient has yet been announced for January. CB has been really busy, so she may decide to skip January altogether. If you’d really like to participate in a cupcake challenge this month however, Iron Cupcake: Earth is now back from Christmas holidays with a fun theme: Winter Warm Up. SO cute! I have a 2-year old baker…skills not quite advanced enough to invent fabulous recipes, though. Hi, Just wondering, now that you are back in Australia if there is anywhere I can purchase these cupcake liners.